Black Gate is very pleased to offer our readers the complete short story “Seven Against Hell” by Janet Morris and Chris Morris, an exclusive sample from the new collection Poets in Hell. In hell, souls sometimes roam diverse underworlds, straying from their native realms. The ancient Old Dead have many judges and gods of hell; the New Dead have few. In hell, if you die you are reborn on the Undertaker’s table, perhaps old or young, forgetful or deformed, to sin more and hunt the manifold hells for relief from damnation. Few find it. Among the teeming damned of hell are all who ever broke even one of the 613 Commandments, from every culture of humanity, whether they knew the rules or harbored faith or not. If you lived, you sinned, you died — and ended here, a soul in torment. Hell is never fair. Diomedes and six of his fellow Argives come up from Erebos in Hades’, summoned to a meeting in dissolute New Hell City where the modern dead hold sway and a poetry festival is under way. This summons is from a friend of old, one he can’t refuse, who needs a favor. Even in perdition, a hero must answer a call to duty…. The complete catalog of Black Gate Online Fiction, including stories by David C. Smith, Jon Sprunk, Tara Cardinal and Alex Bledsoe, E.E. Knight, Vaughn Heppner, Howard Andrew Jones, John C. Hocking, Michael Shea, Aaron Bradford Starr, Martha Wells, Nina Kiriki Hoffman, C.S.E. Cooney, and many others, is here. Poets in Hell was published by Perseid Press on June 11, 2014. It is 410 pages, priced at $19.99 in trade paperback and $6.66 (yes, $6.66) for the digital version. Learn more here. Read the complete short story “Seven Against Hell” here. SEVEN AGAINST HELL is a perfect example of what I like to call Homeric Heroic Fantasy — mythic and epic in scope, and in keeping with the heroic ideal first set down by Homer. 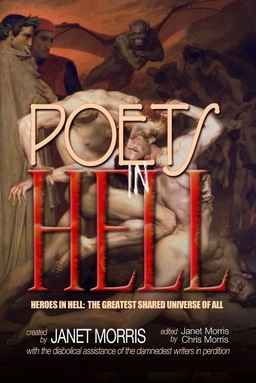 You can read this story, and others ranging in genres from sword & sorcery and thrillers, to horror, romance, and action & adventure, in POETS IN HELL.